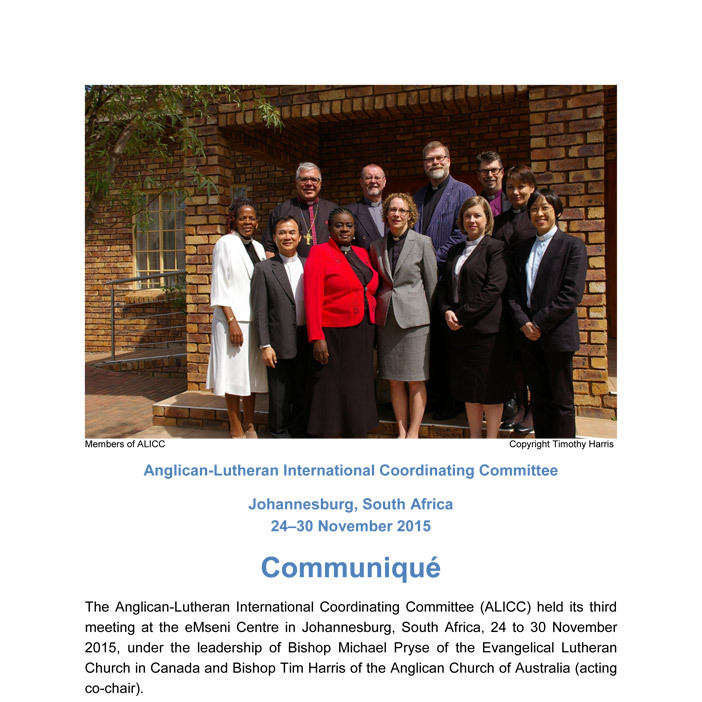 The Anglican-Lutheran International Coordinating Committee (ALICC) held its third meeting at the eMseni Centre in Johannesburg, South Africa, 24 to 30 November 2015, under the leadership of Bishop Michael Pryse of the Evangelical Lutheran Church in Canada and Bishop Tim Harris of the Anglican Church of Australia (acting co-chair). The meeting was hosted by The Lutheran World Federation, with local support from Evangelical Lutheran Church in Southern Africa (ELCSA NT). The Committee warmly appreciated the generosity and the hospitality received from the eMseni Christian Centre. During this meeting the Committee continued to develop resources through which Lutherans and Anglicans can commemorate together the year 1517, the 500th anniversary of the beginning of the Reformation.